Ada pertanyaan untuk Pearl Grand Hotel? Bagi para wisatawan yang ingin menjelajahi kota Colombo, Pearl Grand Hotel adalah pilihan yang sempurna. Hanya 35 KM dari sini, hotel bintang 4 ini dapat secara mudah diakses dari bandara. Premire Pinnecle Pasific, Bullions Exchange, MGM Casino juga bisa dijangkau dengan mudah. Pearl Grand Hotel juga menawarkan berbagai fasilitas untuk memaksimalkan pengalaman menginap Anda di Colombo. Hotel ini menawarkan sejumlah fasilitas di tempat untuk memuaskan segala jenis tamu. Masuki salah satu dari 90 kamar yang menggoda ini dan lepaskan rasa penat Anda dengan sejumlah fasilitas yang tersedia seperti televisi layar datar, akses internet - WiFi, akses internet WiFi (gratis), kamar bebas asap rokok, AC. Pusat kebugaran, sauna, kolam renang luar ruangan, spa, pijat di hotel ini adalah tempat-tempat ideal untuk bersantai setelah hari yang sibuk. Pearl Grand Hotel adalah pilihan yang cerdas bagi para wisatawan yang berada di Colombo dan menawarkan pengalaman menginap yang menenangkan setiap saat. It would be excellent if the Hotel improve these two conditions:- 1. Have a proper luggage stand for customer's suitcase 2. Have some short-eats available at restaurants other than sandwiches Thank you. The stay was average. Needs to value long staying guest and also returning customers. Service was average and can be improved. Housekeeping needs to clean the room throughly and should maintain the service standards. In spite of booking for deluxe room, reception desk put us in a smaller than average room. The room was not made up the next day and youthful holiday makers in the room opposite kept loud music, shouting and banging the door from early morning throughout the night (until 5 a.m.). Upon complaining, the staff arranged for a better room at corporate rate when we booked again from 5-11 january. The bed was comfortable, the service at the front desk is great. Asked for late check out as my flight was at 2am, they agreed to extend the noon check out to 4pm. Many cafes are within walking distance: There is a Majestic City (mall) to the left in 2min [houses KFC and hypermart] at the exit of KFC, you will see Lavazza coffee and pizza hut. Down the road will be the Bambi.... train station. To the right of the hotel, in 5 minutes, you will see Green Cabin - a pastry shop and a dinner place 100 yrs of history. Hotel is on Galle road, a pretty long road with many eateries along it. So you can get a taxi to access places further down Galle Rd. i stayed here just for a single night, check in was very smooth , took me only 5 mins to get my keys to the room with a complementary foot massage and internet voucher. Room was clean and spacious. Fridge was stuffed with soft drinks and juices. As a general rule the checkout time is at 12 , since my flight was at 6 in the evening I requested the staff at the counter if I could make a late checkout. Surprisingly she offered me until 3pm. It was enough time for me to get refs he'd after finishing my business meeting in the morning. I would recommend this place for any traveller looking for a good hotel in the city center. Walking distance to mall at Majestic Mall where you can find nice food court at affordable prices. A supermarket within the mall where nice local tea can be easy found. Just opposite the mall a nice book store. The hotel is nice - nothing special but good value for money. It is centrally located, known by taxi drivers so you easily get there, and the room standard is good. All nice and clean, room service menue with enough choices and tasty. Trip from airport to hotel takes 40 min and . The new highway makes the trip faster, costs 300 Rupees one way. superb hotel for business and leisure travel for short stay, great location, flexibility on checkout times was an advantage, very friendly and helpful staff, easy access to shopping and restaurants, close to major attractions. Hotel rooms were clean and well kept, good restaurant with room service. I would recommend it to anyone on holiday/business. Pearl grand is very new, it is clean with fancy design. The staff is friendly & helpful, hotel provides money changing service in fair rate. The hotel restaurant provides food in a great many of variety at reasonable prices. The hotel is new, about 4 months old. Staffs was very helpful as I check-in at on the 05th March at 2am even the check-in time was 2pm. However, they letme check-in and and discusse the issue later in the morning. I explained that I have to check-out the same day at 10pm. Actually, I have to pay an extra day. However, the Manager charge me an extra half day as a goodwill. booked this hotel at the last minute on a rush return to colombo from galle. i was very impressed with the new feel of the hotel along with the comfortable layout of the rooms, with all amenities you would normally expect from a hotel. the complimentary wifi was an added bonus as was the roof top swimming pool. the only detractor that i had for the hotel is that it did not serve alcohol of any type, a beer on the rooftop while watching the sun set over the indian ocean would have been a great way to end a day. Overall is good. Nice pool on roof top. Room is clean. Hotel is new but dont know how long it will last. I consider it as 3 star (International Standard). Breakfast is more local taste. Hotel Location is at Junction (behind to their sister Motel), heavy traffic as normal in Sri Lanka. Front desk staff seemed a little fierce. Gym staff's service was very good and there is a nice rooftop bar beside the pool. Our room was clean and served its purpose, with good selection of cable channels. There was however no room service menu or any hotel detail booklet in our room. Breakfast was delicious. Location was superb, you can walk to majestic city, barefoot store, and mgm casino. There are some local eateries along galle road which sell hoppers, curry and rice and fried chicken at very cheap prices. I highly recommend the hotel for its location. have a very pleasant 3 nights stayed in pearl grand. the finishes in the bedroom are new and properly arranged. 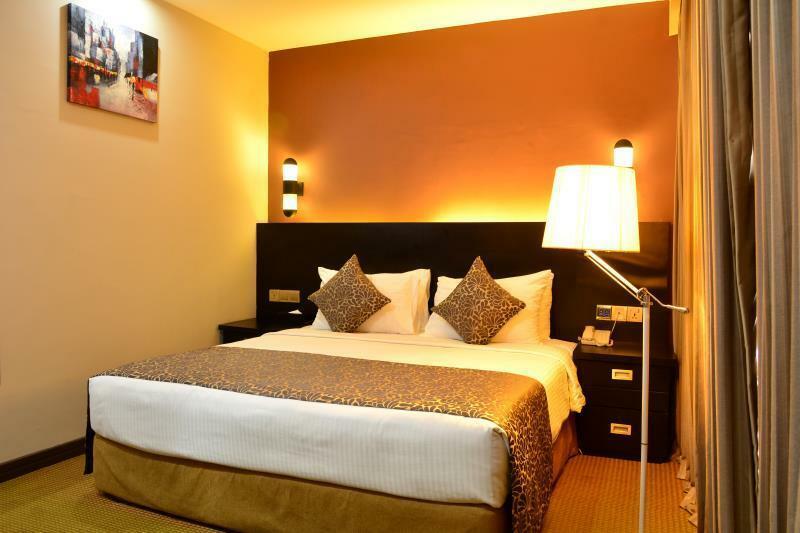 the hotel comes with roof top pool and gym facilities for a good work-up. the business center offers much needed help during my stay to catch-up with my works and provides with free printing facility. the staffs are friendly and helpful when approached. it was very much an enjoyable stay throughout. in my two dinners no other guests were in the restaurant. however, the service was very slow, staffs were very noisy talking at their local language. they didn't care us, many times I rise my hand and called for service. I spent two nights at the hotel, after first day of room clean, no towels provided. I had to call housekeeping for towels. That's not acceptable. I made booking with Agoda but when I arrive there was no Agoda booking for me. They said, they have same name booking from Aitkenspence and kept me waiting for more than 30 mins to double check. However, front office staff was pleasant and helpful.